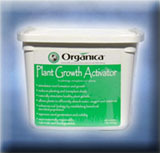 Organica Plant Growth Activator Plus (PGA PLUS) was applied to 10 week - old Lisianthus "Maurine Blue" grown in 6 packs containing a peat based medium. A randomized complete block design with 6 replications consisting of an individual six-pack per treatment and non-treated control replication was used. The plants were maintained at 28 degrees C / 82 degrees F and exposed to a 12 hour / 12 hour light / dark cycle. The plants were inoculated with 15 ml soil drench containing 1x 10 to the 6Th microconidia / ml of the active fungal pathogen Fusarium oxysporum (a very high dose). Plants were examined for disease incidence and mortality once a week for 6 weeks. 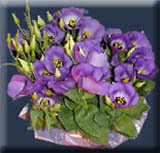 Occurred 7 days after transplantation of Lisianthus into 6 packs. One (1) pound of PGA Plus was dissolved in 100 gallons of water and 10 ml of this solution was applied as a soil drench. This rate equates to 2 oz. per 1000 sq. ft or standard label rate. Occurred 24 hours prior to inoculation of the active fungal pathogen Fusarium oxysporum. During the 6 week trial PGA Plus was applied at 2 week intervals. For all of the subsequent applications two (2) ounces of PGA Plus was dissolved in 100 gallons of water and 10 ml of this solution was applied as a soil drench. This equates to 0.25 ounces per 1000 sq. ft. or one-eighth the label rate.